Horizontal blinds consist of slats that can be tilted to efficiently control light and provide protection from ultra violet rays. Horizontal blinds are ideal for windows that are taller than they are wide and are raised and lowered. When the slats are open they can reduce the sun’s glare but not your view. 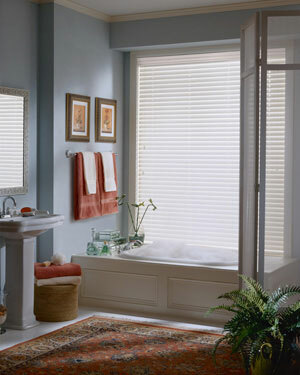 Horizontal blinds are extremely popular and come in many different materials, colors and finishes. 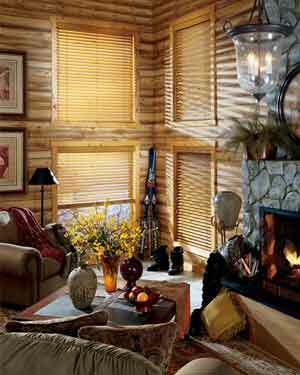 Horizontal blinds are offered in real hard wood, alternative-wood, sometimes called faux-wood, and aluminum. For warmth, durability and versatility, real hard wood is the natural choice for almost any decor. Like fine furniture, wood blinds reflect a lasting level of quality and are available in a variety of paints, stains and finishes. Horizontal blinds can be manufactured to fit almost any size and shape window. This installation versatility, along with the color, finish and material options, allows these products to be suitable for almost any window in a home. 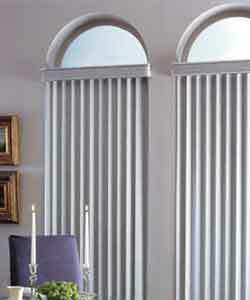 They offer optimum light control by tilting the horizontal slat and are available in many design options. Horizontal blinds can also be used with top treatments, or as under treatments in combination with draperies. These products can be installed with an inside or outside mount depending on the window molding and sill construction. Horizontal blinds can be used in almost any design scheme. The type, finish and color of the blind make all the difference. For example, a light colored wood blind can easily fit into a causal country or traditional setting, while a cool colored aluminum blind is perfect for a contemporary urban loft. Dark, rich wood tones are a beautiful compliment for a home office. Precision crafted from the finest North American hardwoods, including genuine oak, ash, cherry and Brazilian cherry, our Genuine Wood blinds exude tradition and character. If you like the warm, luxurious look of fine hardwood blinds, but want something more practical and less expensive, you may want to consider alternative wood blinds. These blinds are also desirable in extremely hot, humid conditions since they resist warping, cracking and fading. Alternative wood blinds are made from engineered materials and come in many hues and finishes that can allow you to create a beautiful room while remaining budget conscious. Aluminum blinds are a great choice, simply because they offer so many options, including color, texture, design, and most importantly, light control. Their clean lined design makes them especially well suited for a contemporary setting. Vertical blinds have vanes that traverse and rotate smoothly, offering privacy and light control as well as UV protection for interior finishes in the home. Vertical blinds are available in a full range of finishes and textures, from moderately priced vinyl to high quality fabrics. They are perfect for patio doors or windows that slide side to side. With the multitude of colors and patterns these products can be used in many decorating schemes. They can be installed alone for a clean contemporary look or combined with draperies in a more traditional setting. Vertical blinds also come with option of right, left or split stacking configurations.